The vast forest of the Congo Basin is the second-largest tropical rainforest on Earth and serves as the lungs of Africa. It’s incredibly rich and diverse ecosystem provides food, fresh water, shelter and medicine for tens of millions of people and a home to critically endangered wildlife species. Baby mountain gorilla (about 1 year old) in the Virunga National Park. Of the hundreds of mammal species discovered in the Congo Basin so far — including forest elephants, gorillas, chimpanzees, and okapis — 39 are found nowhere else on Earth. Of its estimated 10,000 plant species, 3,300 are also unique to the region. The Congo Basin rainforest supports an astonishing range of life within its teeming rivers, swamps and savannahs, but it also helps to sustain life across the whole planet. The soils and plants of the Congo Basin rainforest store incredible amounts of carbon, preventing it from being emitted into our atmosphere and fueling climate change. Forests in the Democratic Republic of the Congo (DRC) alone are estimated to be the fourth-largest terrestrial carbon reservoir in the world. 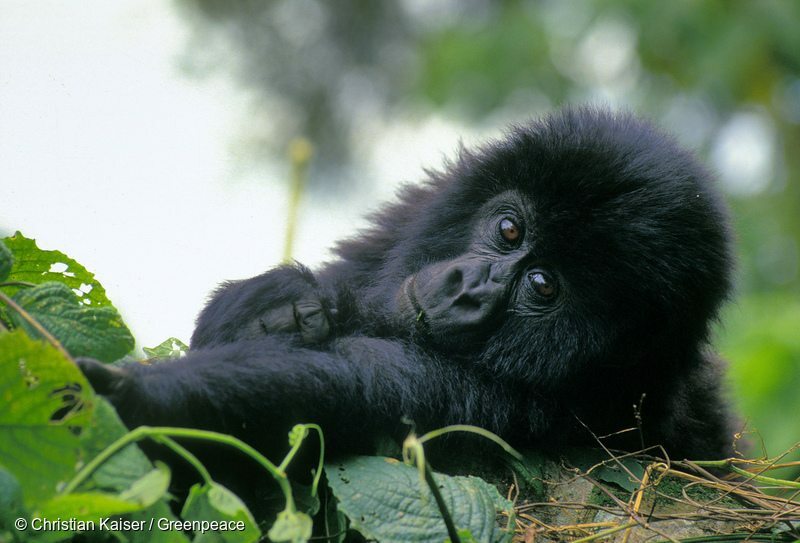 Despite all this, the Congo Basin’s forests are under threat. In recent years, investors from around the world have been focusing heavily on Africa in efforts to exploit the continent’s rich natural resources, often at the expense of local communities and the environment. The trend of buying or leasing large areas of land in Africa to extract resources for export has been termed “land-grabbing” due to the speed and scale at which it’s taking place and the opaque nature of some of the land deals that have been negotiated. 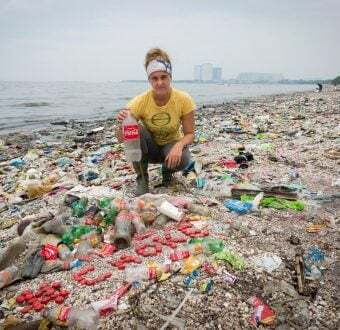 The UN has warned that these deals could severely undermine food security, hamper long-term economic development, and lead to the loss of important ecosystems. The Congo Basin is the target of several international industrial-scale agriculture developers, including palm oil and rubber, who are looking to cash in on new operations in Africa. These plantations, however, often fuel wide-scale deforestation and spark social conflict. Aerial image of forest clearance for a oil palm nursery managed by Herakles Farms. 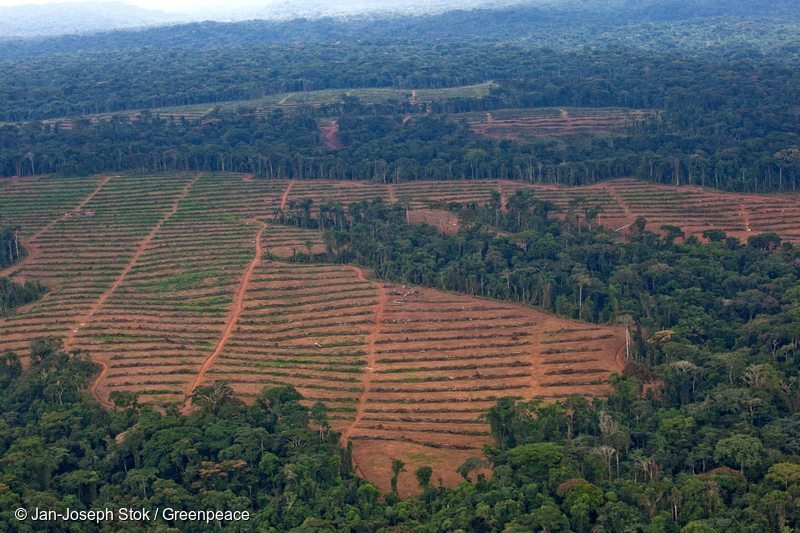 Greenpeace first introduced you to one of these destructive palm oil projects in 2012. Herakles Farms was a deceitful U.S.-owned corporation aiming to develop a huge new palm oil plantation, known as SG Sustainable Oil Cameroon (SGSOC), in the southwest region of Cameroon. This project became widely known as a stark example of the kind of threats that industrial plantations can present to human rights, wildlife, and the global climate. It was poised to destroy a large area of dense, carbon-rich natural rainforest, including critical habitat for endangered wildlife like the chimpanzee. 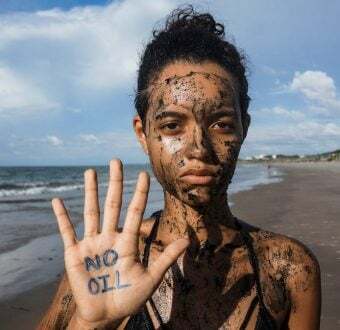 And it was doing so without the consent of local communities, many of which began actively opposing this international corporation in an effort to stop them from stealing their traditional land. Many voices joined Greenpeace in the call for this destructive development to be stopped before it was too late for the people and forest of Cameroon. Unfortunately, despite the project size being dramatically reduced and the original investors leaving the project, SGSOC is still moving forward. Research shows this project is continuing to clearcut dense natural rainforest that has been identified as vital for endangered wildlife and often serves as a corridor between five nearby protected areas. And despite claims that the project will boost the economy and create jobs, the company’s plans continue to be met with widespread opposition from communities and have attracted fierce criticism from local NGOs. In 2015, some of the few that did get jobs from this project not only lost them but claim to not have been paid for past work. The SGSOC palm oil plantation is the wrong project in the wrong place, and Greenpeace is dedicated to fighting for the people and environment in Cameroon and against destructive projects like this one. 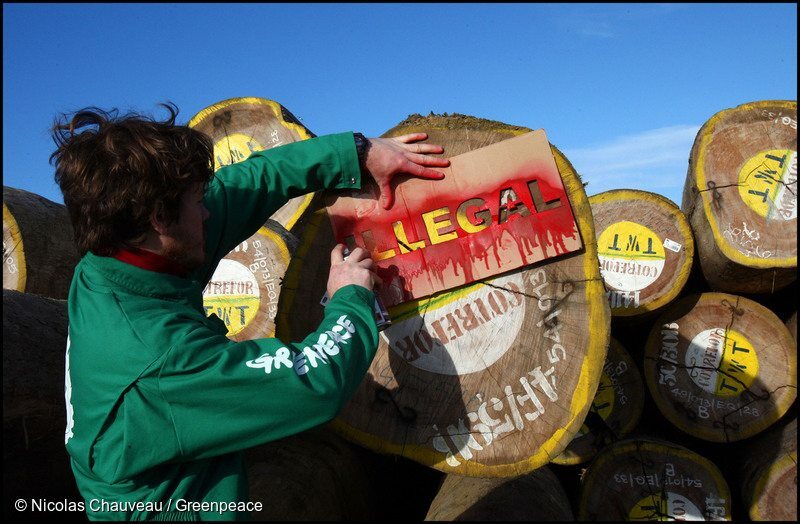 Activists from Greenpeace France uncover shipments of suspected illegal timber from the Democratic Republic of Congo (DRC) in a French port. Unsustainable and illegal logging in the Congo Basin forest — by both big and small companies — is leading to deforestation, destruction of wildlife habitat, diminished resilience to climate change, and damage to local communities. For too long, valuable trees have been illegally cut for timber and exported for products like furniture and flooring. Currently, illegal timber cut in the Congo Basin is being sent around the world, including to the United States, the European Union, and increasingly to China. Both the United States and the EU have banned importing illegal timber. The Lacey Act and EU Timber Regulation respectively are beginning to be enforced and changing how companies assess the timber they are buying. However, as long as illegal timber can flow into China, be turned into finished consumer goods, and then resold on the global market, the incentive to illegally log the Congo Basin forest will remain. Greenpeace is investigating how this triangle of timber interests (between Congo Basin countries, China, and developed countries ) fuels uncontrolled logging operations today, but may one day be the path to stopping illegal loggers in their tracks. By following where illegal timber from countries like Cameroon and the Democratic Republic of the Congo ends up, we’re shedding light on the global timber trade and exploring ways to put an end to the driving forces behind illegal logging.